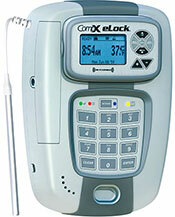 LockView provides overall management of an infinite amount of CompX eLocks. Administrators can establish databases of users and eLocks, manage temperature monitoring data and view audit trail logs. LockView 5Pro is for use with 300 series eLocks only. LockView 5Pro is easy to use, with many programmable options, and can be used to update all eLocks through a facility's existing Wi-Fi or Ethernet infrastructure or connected directly to a laptop via USB cable. LockView provides a comprehensive audit trail of the last 15,000 access attempts and records up to 500,000 temperature data points. When connected to the network, LockView has the ability to send escalating alerts to list of responders. Notifications can be sent via email, text, voice messaging or fax. LockView 5 is for use with 200 and 150 series eLocks only. LockView 5 is easy to use, with many programmable options, and can be used to manage / update an eLock when connected directly to a laptop via USB cable. LockView provides a comprehensive audit trail of access attempts and records up to 500,000 temperature data points (200 series refrigerator eLock only). LockView 4 is for use with 300 & 200 series eLocks only. 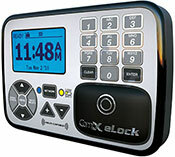 LockView 4 is easy to use, with many programmable options, and allows access to any eLock from any computer on the network. LockView provides a comprehensive audit trail of the last 15,000 access attempts and records up to 500,000 temperature data points. If connected to the network, LockView has the ability to send escalating alerts to list of responders. Notifications can be sent via email, text, voice messaging or fax. Click for more information on LockView 4. LockView 3 is for use with 100 Series eLocks only. LockView makes it easy to monitor audit trails for the last 1,500 access attempts, manage users and eLocks, and assign time-based restrictions / dual credential access. Downloading and uploading information is simple. Attach one end of the RJ-11 cable to the back of the CompX eLock° and the other end to a laptop computer. Click for more information on LockView 3. Click to view the LockView software license. The LockView license provides acceptable usage, terms, warranty and other conditions of use. Call 847-752-2500 with any questions. 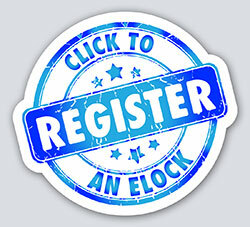 Standard warranty on software is 90 days from date of purchase and registration. There are no yearly service costs, but additional tech support is offered at an additional charge. 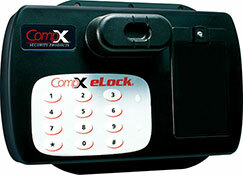 This is only a fraction of CompX eLock options. 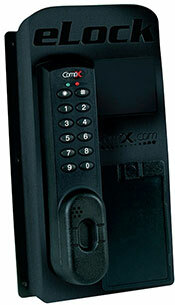 CompX Security Products has the design and engineering capabilities to meet specific application needs. Contact us for more information or call 847-752-2500. Or click to compare eLock versions. 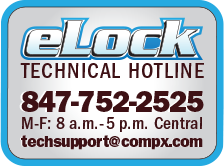 on CompX eLock product news! Get the latest info on new products, promotions, trade shows and events - delivered right to your inbox.